Here’s a clip of an in-transition Rolling Stones and their lesser-known track, “Child of the Moon”. The song was a B-side to the “Jumpin’ Jack Flash” single, which later appeared on their Beggar’s Banquet album. “Child of the Moon” can be heard on the superlative collection Singles Collection: The London Years , which takes in the of the Stones’ first phase as a 60s blues-pop and psych-blues singles band starting from 1963 to 1971. Before they became the arena-filling behemoths that they are today, the Rolling Stones were once a mighty singles band. It’s true that their primary musical idiom was a form of blues-rock, mixed in with the R&B flavourings of the whole British Invasion sound. But, by 1967, the expectations placed upon the pop single were beginning to give way to the use of more ambitious production values, and with greater sonic variety. And this is besides the fact that the album was beginning to eclipse the pithy, three-minute single, thanks in part to Sgt. Pepper. 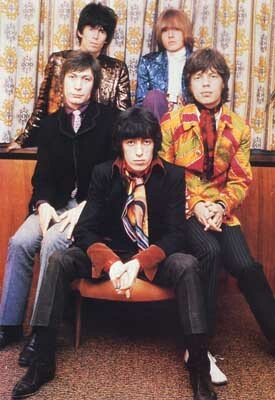 So in light of this, the Stones tried a number of grand experiments to stretch themselves. First, they threw a couple of unexpected instrumental textures into their work, largely thanks to Brian Jones who was adept at playing a number of instruments outside of the rock spectrum. Second, they embraced psychedelia on their oft-derided (unfairly so, I might add) Their Satanic Majesties Request album, which included their underrated singles “She’s a Rainbow” and “2000 Light Years From Home”, which we both a far cry from “(I Can’t Get No) Satisfaction”. And third, they brought in sessioners like pianist Nicky Hopkins to add extra flair, depth, and dexterity to their material. This experimental period would not last long, of course. This song, “Child of the Moon” was recorded in late 1967, to be released the next May. It caught my ear when I first heard the Singles… box as a tune which didn’t really sound like a typical Rolling Stones track. To me, it was the choppy guitar lines reminiscent of what U2’s the Edge would employ a decade or so later. Jagger’s disembodied vocal, and the hazy atmosphere to the track stands as a stylistic testament to a group who weren’t afraid to step outside of their comfort zone. Where the Stones would incorporate a number of stylistic ingredients into the 1970s which would include reggae and disco, it was here that their experimentation sounds at its most honest, least like a bid for commerciality. By 1968, the sweetness and light of the psychedelic period had given way to darker tones. And “Jumpin’ Jack Flash”, “Sympathy For the Devil”, “Street Fighting Man” and, later “Gimme Shelter” fit the bill nicely to suit the turbulent times. The band established their sound based in the blues, hard rock, and country, a sound which they would develop, sustain, and then arguably let stagnate in varying degrees for decades to come. As a B-side to “Jumpin’ Jack Flash”, “Child of the Moon” is something of a transitional piece, a last gasp of a band about to transform into an entity which would exist on a different and certainly larger scale by the next decade, when they would no longer be in the position to try something this uncharacteristic. Where it can be strongly argued that 1968 – 1972 is their artistic pinnacle, there is a lot to be said for the 1963-67 singles-era, when they were still finding their feet as a band, trying different approaches, and gaining some unexpected, and very welcome results. They would never be this same band again, of course.